I have been experimenting with a couple of different Lara Bar recipes as of late. I started tweaking them, changing out this ingredient for that ingredient switching sweeteners, adding extra ingredients until this last bath where I got them adjusted perfectly to my sweet tooth liking. In fact I think they taste more like cookie dough than they do Lara bars now and yet they are sweetened with just a touch of maple syrup and a few chocolate chips (which you could omit if you want to , or replace with carob chips for an even healthier indulgence). Far less sugar, and empty calories than one would find in real cookie dough. I prefer rolling them into balls, but you could take a smaller pan and squish them into a bar. 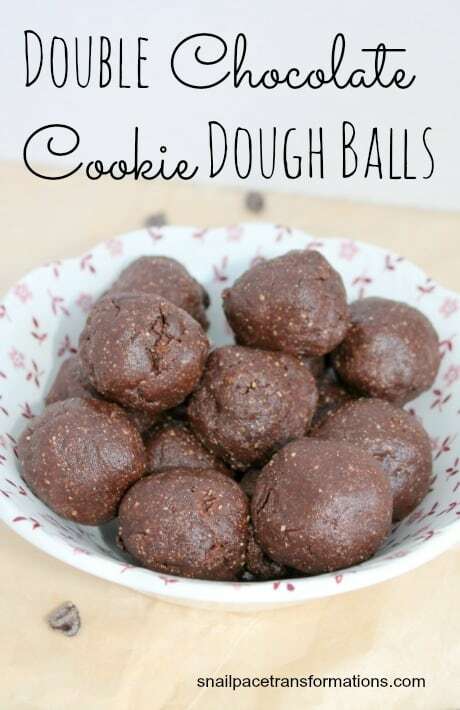 I like placing the balls on a cookie sheet and then putting the in the freezer for one hour. I then put them all in a ziploc bag in the freezer and either pop them in my mouth frozen. You could also store them in your fridge if you prefer. Each one is about 2 bites worth each and is right around 150 calories, and are extremely yummy, and healthy! After 3 tbsp of syrup the dough should be one uniform mass, if not add a bit more syrup. This is perfect for my after school snack ideas, which are currently lacking. Especially since the kids can’t have nuts at school. Agh – I miss homeschooling!!!!!! Glad you like it Melodie. Just finally got around to making these. Very yummy. Not too sweet at all. I used brown rice syrup and honey as I had no maple syrup. Also substituted hazelnuts for peanuts. So good! Aren’t they Mel! I could not keep my hands off them. I am all out and have to make more! And now I am rating the recipe…. Thanks Mel! I am so glad you liked them.